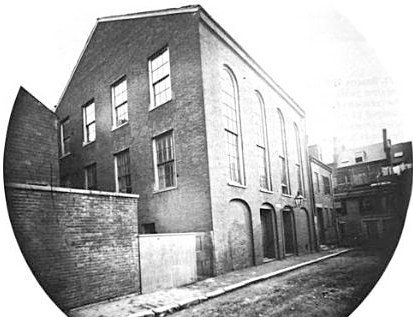 The African Meeting House, also known variously as First African Baptist Church, First Independent Baptist Church and the Belknap Street Church, was built in 1806 and is now the oldest black church edifice still standing in the United States. It is located in the Beacon Hill neighborhood of Boston, Massachusetts, adjacent to the African American Abiel Smith School. Before 1805, although black Bostonians could attend white churches, they generally faced discrimination. They were assigned seats only in the balconies and were not given voting privileges. The African Meeting House was constructed almost entirely with black labor. Funds for the project were raised in both the white and black communities. The facade of the African Meeting House is an adaptation of a design for a townhouse published by Boston architect Asher Benjamin. In addition to its religious and educational activities, the meeting house became a place for celebrations and political and anti-slavery meetings. On January 6, 1832, William Lloyd Garrison founded the New England Anti-Slavery Society here. During the Civil War, Frederick Douglass and others recruited soldiers here for the 54th and 55th Massachusetts regiments. Lectures and information about meetings in this space can be found in Garrison’s newspaper, The Liberator. Many of our blog posts about The Liberator can be found here. Step into the sanctuary of the African Meeting House in Boston, and you will walk on the same ancient floorboards where Frederick Douglass, William Lloyd Garrison and other prominent abolitionists railed against slavery in the 19th century, and where free black men gathered to shape the famed 54th Massachusetts Civil War regiment. After a painstaking, $9 million restoration, the nation’s oldest black church just reopened to the public. via Anti-slavery hub opens after restoration.